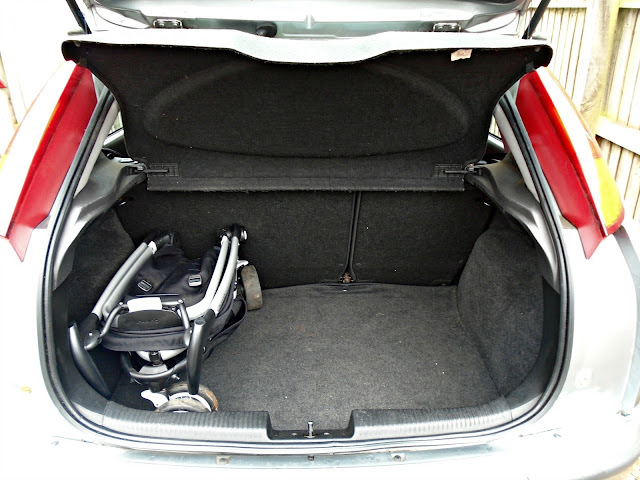 A few weeks before we were due to go on holiday this summer I came to the sudden realisation that, whilst I love our big pushchair it takes up our whole boot meaning there was going to be absolutely no room for luggage! We are not a family that travels light so boot space was essential and so we had to look at getting a more compact pushchair. Luckily the lovely people over at Quinny came to our rescue, offering us a Quinny Zapp Xtra 2 for review. The Quinny Zapp Xtra 2 is designed with one thing in mind - to make life easier and it certainly did for us. 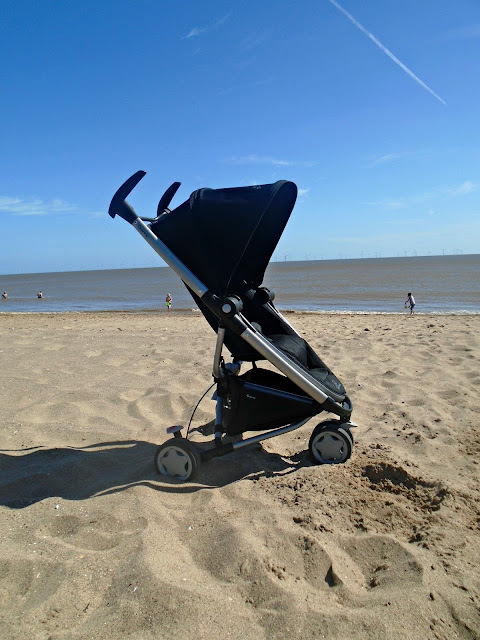 Our first impressions of the Quinny Zapp Xtra 2 were really good. It looks sleek and elegant and it has a really good size seat unit. Evelyn is 2 but still uses a pushchair for long walks and near roads etc and some pushchairs have quite a small seat area, however the Quinny Zapp Xtra 2 offers a really generous size seat which is padded and looks super comfy. The next thing we did with the Quinny Zapp Xtra 2 was test it out in the car, after all this was our main concern with the previous pushchair. I was amazed at just how small the Zapp Xtra 2 folds down! It easily fit in the boot of our Ford Focus alongside 2 of our huge suitcases as well as all our holiday items for 7 nights. Putting the pushchair together was simple when it arrived. It was simply a case of clicking in the wheels (make sure you hear 2 clicks) and attaching the basket and we were ready to go! Putting the pushchair down however was a little more complicated to begin with. To collapse the pushchair you first fold the seat unit down then simultaneously press the numbered 1 and 2 buttons either side of the seat unit, this folds down the handle bars. This is when it got tricky you then have a section at the back on the bottom labeled 3 and 4 and you have to push 3 down and push 4 in. I found this a bit tricky to begin with but after a few attempts (and a few watches of the You Tube video) I had it worked out and its actually really simple to do but definitely a 2 handed job. The basket on the Quinny Zapp Xtra 2 isn't huge but this seems to be standard on most lightweight stroller style pushchairs. However its actually quite deceptive. We managed to fit 2 water bottles, sun cream, 2 nappies a pack of wipes, a change of clothes for Evelyn and a few snacks all underneath in the basket so I was pretty impressed! Another thing I love on the Quinny Zapp Xtra 2 is the extendable sun canopy on the hood, this really came in handy whilst we were on holiday. When not needed the hood is a standard size but when needed you can unzip the middle section of the hood, allowing you to extend the hood further and providing lots more sun coverage. Evelyn can sometimes get frustrated when the sun gets in her eyes but still wants to see out and Quinny have this covered. The Quinny Zapp Xtra 2 is suitable from birth right up until you choose not to use a pushchair, its that versatile. It can rearward and forward face and can even be converted in to a travel system using the Maxi-Cosi Pebble or CabrioFix car seat. I love the adaptability of the Zapp Xtra 2 and that you could just buy this one pushchair to last throughout. 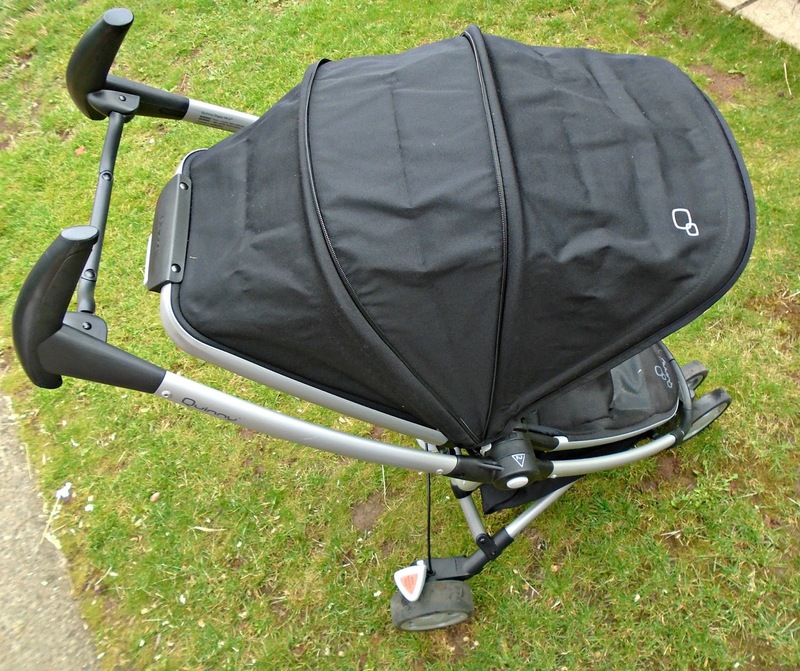 Our over all verdict of the Quinny Zapp Xtra 2 is a big thumbs up! It is lightweight, easy to use and push and is small enough to fit in any boot. It comes with the extendable hood as well as a easy to use rain cover meaning you are covered for all weather.The most important thing for us, Evelyn seems to be happy and comfy so we would definitely recommend it. Have you tried out the Quinny Zapp Xtra 2 yet? This looks like a pretty awesome product! I don't have kids but when I do I hope something like this is about as it seems handy. Wow - this looks a fantastic size and I love how little boot space it takes up! This looks great, I can't believe how small it is once it's folded down! The sun canopy is such a good idea too.